Hardwood flooring* is an indisputably good investment — albeit a not-insignificant one. Which makes it all the more important to care for and protect it for decades to come. How hard can it be, you ask? You'd be surprised at how many pernicious myths are out there (thank you, The Internet) about the cleaning and care of your floors. And the price you pay for believing them can be steep, taking years off the lifetime of your investment — and, in some cases, even voiding the warranty on your floor. Never fear! 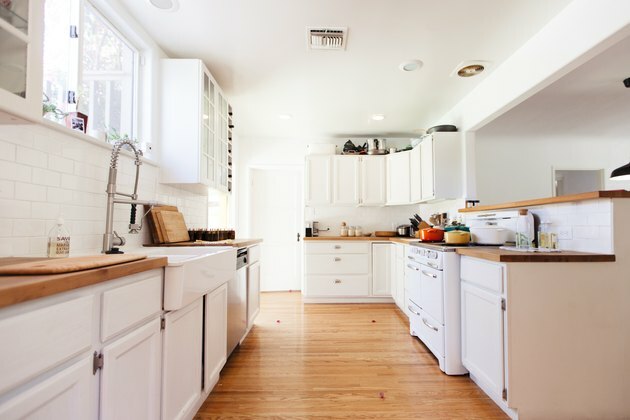 We're here to bust the most common of these myths — and help you keep your floors as beautiful and resilient as the day you got them. Myth #1: Just use a bucket of water and a mop. When in doubt, just use water, right? This goes against one of the great truisms of housekeeping: water and wood don't mix. Wood absorbs standing water — especially if the floors aren't sealed perfectly or properly. And wet hardwood can swell, warp, crack and splinter. Similarly, mopping with water alone doesn't do anything to prevent dirt buildup. And it can leave a dingy finish. Myth #2: Just use vinegar and water. Sure, distilled white vinegar is an inexpensive, non-toxic powerhouse for many of your household cleaning needs. But--despite lots of debate--it's not really the right choice for hardwood floors. First, it's acidic. The acetic acid in vinegar can wear away or etch the polyurethane finish, which, over time, will make your once-gleaming floors seem dull. Second, a mixture of vinegar and water typically isn't as effective as a neutral pH soap or cleaner, formulated for wood, when it comes to pulling up dirt and grime. Myth #3. Just use ammonia. Like vinegar, ammonia is an old-school household cleaner that does wonders for a lot of surfaces. But, also like vinegar, ammonia is bad news for your hardwood floors. Unlike vinegar, however, ammonia is a base, with a pH around 11 — similar to household bleach. Because it's not a neutral pH, it can be harsh on the finish, causing discoloration over time. Myth #4. Just use a steam mop. Steam mops offer the promise of a deep-down sanitized cleaning with minimal effort. But when it comes to hardwood floors, what it really does is take the great truism of housekeeping — that water and wood don't mix — and make it worse by adding heat. With regular use, steam mops can cause hardwood floors to peel, crack and discolor — and in many cases will void your warranty. Myth #5. Just use a vacuum. Vacuums, in particular those with rough bristles or a beater rug attachment, can scratch the layer of sealant on the floor. A microfiber dust mop or gentle broom will do for quick, daily maintenance. This is one of the most important, overlooked maintenance steps to prevent scratches on your floor. Myth #6. Just use an oil-based cleaner. Oil-based cleaners are suitable for certain types of wood furniture. But with hardwood floors, you're not technically cleaning the wood — you're cleaning the polyurethane finish. Oil cleaners also leave a buildup on the floor that can make it difficult down the road if and when you want to refinish. Some truth. The less liquid you use the better. A fine mist of a neutral pH cleaner specifically made for hardwood floors — such as Bona® Hardwood Floor Cleaner — is really all you need. Wipe it up with a dry or damp (never wet) microfiber cloth, which is gentle enough not to scratch but effective enough to deal with the dirt, dust and pet hair that floors accumulate so easily. Repeat once a week, in addition to daily sweeping, for optimal results. When you have a busy household or are in a pinch for time, there are also effective solutions that quickly clean dirt and grime to reveal your floor's natural shine. Or, when you need to go above and beyond regular cleaning, find a pro to help with a deep clean using a high-powered scrubber and hardwood-safe solution. *This article deals primarily with hardwood floors with a polyurethane or urethane finish, not waxed or untreated hardwood.